Cloud-based video conferencing is a great way for small to medium sized businesses to get involved with multi-point video conferencing. These businesses do not need to purchase expensive infrastructure components, nor do they need the support personnel needed to run that infrastructure. Simply sign up for a relatively inexpensive cloud-based service and meet with your clients, colleagues, friends, and family. The quality is great and the services are on 24 x 7. Use this blog post as your jumping point to the world of cloud-based video conferencing. This is a living breathing blog post that will grow over time, so check back often! Google Chat, Skype, H.323, Telephone call-in, Web RTC browser, Microsoft LYNC, SIP is in Beta. Schedule a meeting or an instant meeting to fire up the virtual room. People call in or the system can call them. Full administration to add, drop, mute, etc. Virtual WaterCooler call in is supported, up to 12 hour call duration on multiparty, unlimited on one to one calls. Adminstration: All call participants have the ability to add/drop participants, share content etc. Connections is chair-person-less. 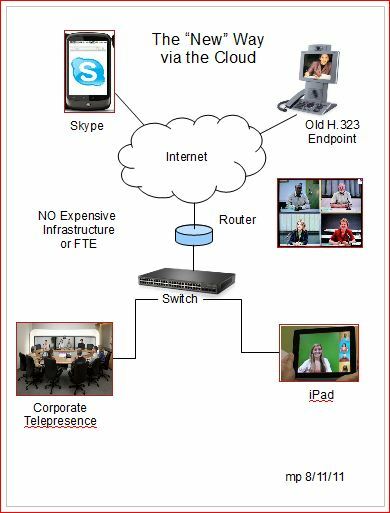 H.323, SIP, Skype, and Audisoft Frontline Communicator connectivity. Supports Android and iOS mobile devices as well as “kits” available for Windows and Mac computers. Up to 10 participants in a meeting, can share presentations, etc. PeekTime allows you to connect video conference enabled rooms (Cisco, Polycom, Avaya, Vidyo, Huawei), any Mac OS and Windows computer with web RTC browsers (Chrome, Firefox, Opera). It has scheduling via a mobile app and will soon have streaming and recording. Supports up to 12 participants. Downloaded app on your browser, presentations / desktop sharing, video conferencing (3 for free). Mobile apps available. Zoom, the cloud meeting company, unifies cloud video conferencing, simple online meetings, and group messaging into one easy-to-use platform. Our solution offers the best video, audio, and screen-sharing experience across ZoomPresence, Windows, Mac, iOS, Android, and H.323/SIP room systems. More to come soon….help me build this list. A few questions: In the Cloud…Do you support? Google Chat? Skype? H.323 EP’s? SIP EP’s? MS LYNC? Web RTC? Do I need to schedule a meeting then people call in? Can I set up a “virtual watercooler” meeting space that is available 24 x 7? Do you have administration features that allow a moderator / leader to add, drop, mute, etc participants? * We have a full IT administration backend which allows set up of user groups, roles, levels of privileges, profiles, features available to users, etc. Within a vcall/meeting, the person who initiated the call can add or drop participants. Anyone on the call can raise or lower mic and speaker volumes for other participants. I think if you mention WebEx you also should not forget about GoToMeeting. I would say they are in the same league. Although GTM doesn’t do HD IMHO. Another big player would be Adobe Connect and a plethora of “smaller” products like ooVoo, Saba Meeting, etc. I’ve just registered for a trial of IOCOM Visimeet and so far I like what I see. The video quality is really good (up to FullHD) and the desktop sharing feature offers high motion support which I miss from other competitors (maybe someone knows some). The GUI needs getting used to. Vismeet also offers H.323/SIP connectivity. But I couldn’t test it yet. Apparently IOCOM is collaborating with Vidtel to interoperate with Skype and Google Talk. Then there would be also SeeVogh from the guys at Caltech. You mentioned it before in the blog. ooVoo was one of my favorites when it first came out, I never liked Adobe Connect (oh, sorry…), I will look at Saba…I suppose you are right, these are technically “cloud-based” videoconferencing services and have been around (at least ooVoo and Adobe) for quite awhile…. Another cloud videoconferencing http://www.liveconf.net. Vidyo based but works with Skype, H323 and other stuff. Have a try. Looks not bad. Take a look. Hey, in addition to cloud based video conferencing such as bluejeans, easymeeting etc. one can even deploy on premise web-video conferencing appliance such as RHUB appliances in order to conduct webinars, web conferences, online meetings etc. MIVNETConnect.com offers a pretty cool solution and a marketplace. If you have not visited lately, try a free meeting guest account.